Posted by Kearsten Chapman on December 30, 2015 at 11:35 AM. Filed under Smart Home, LED Lighting, Mobility, News, Power, CES . 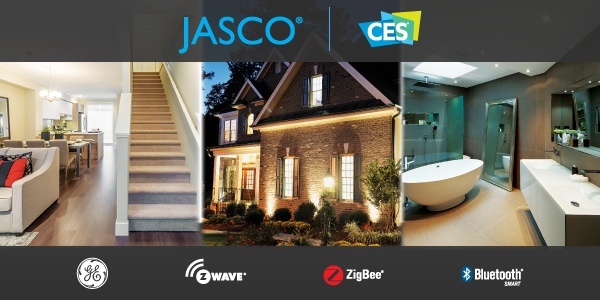 With so many things to see at the 2016 Consumer Electronics Show (CES), make sure to visit the Jasco booth in Central Hall of the Las Vegas Convention Center and see why millions choose GE and Jasco for their connected home and mobile solutions. Jasco is located at Booth 9005 in the Central Hall of the Las Vegas Convention Center. Look for Jasco's booth as you enter the C1 entrance from the Grand Central Lobby. Join us and make a difference in the world by stopping in at our Water4 exhibit. Plus you won't want to miss these top 7 things to see the Jasco Booth (#9005, Central Hall). Jasco is the only technology company leading in the top three wireless technologies for home automation including Z-Wave, ZigBee and Bluetooth Smart solutions. Experience the most comprehensive line of connected home products at booth 9005 (Central Hall/LVCC). Discover how Jasco and Water4 are working together at CES to change the world with safe water. Learn more about this unique effort, and see the technology that is being used to save lives and transform entire communities around the world. For every badge scanned at the Water4 +Jasco exhibit, Jasco will donate $1 and will match all contributions made during CES dollar-for-dollar. Learn more about Water4 and the global water crisis here. Help Save Lives. Win Free Stuff. CES attendees will not only have the opportunity to make a difference in the world at CES, but also win some pretty awesome stuff. Attendees visiting the Water4 + Jasco exhibit at booth 9005 will have the chance to win daily prizes like an Apple Watch, Apple TV, and VISA gift cards as well as swag bags filled with tech tools, gadgets and free swag giveaways every hour. Talk about a win-win! Power up and stay connected at the complimentary charging station within the Jasco booth (Central Hall/9005). Experience first-hand Jasco’s UltaCharge™ technology and charge your devices at the fastest rate possible with GE branded USB chargers and cables. Use any smart device to automate your home lighting and appliances, no Wi-Fi, hub or service needed! With over 100,000 units already shipped to the market, GE branded Bluetooth Smart Devices are seeing one of the quickest and most successful launches in mesh-networking. Visit the Jasco Connected Home booth and see for yourself why this ecosystem is experiencing such a strong market response from retailers and consumers. Jasco unveils its next generation of GE branded Z-Wave Plus® Certified products at CES 2016. Featuring the new Z-Wave enabled Smart Door Sensor, In-Wall Smart Motion Switch, and six new plug-in smart controls, the new GE branded Z-Wave Plus products are powered by the latest advancements in Z-Wave technology. You can also find our Z-Wave products at the Z-Wave Alliance Pavillion, located at Booth 21000 in the South Hall. Jasco will showcase its strongest lineup of USB charging solutions to date including a new line of USB-C cables and universal charging solutions for all USB devices. The latest collections are designed to accommodate any type of mobile device to provide a reliable universal charging solution for the home, office and on the go. Jasco UltraCharge™ technology maximizes charging rates and is up to 40 percent faster than other 5.0V/5W chargers on the market today. Stay connected on Facebook and Twitter for the latest updates, product news and CES giveaway announcements.